Avedas’ facial treatment services are inspired by Ayurveda, the ancient healing philosophy of India that seeks to holistically restore balance to body and mind to achieve optimum health and wellbeing. Each of these elements have their own delicate balance within your body - when one or more of these elements become out of balance, the body reacts, both physically and emotionally, and this can show on your skin. At Treat, we work to restore balance to the five elements, and thereby your skin, by engaging all five senses (sight, smell, sound, taste, touch) throughout our Tulasara facials with pure aromas and nurturing high-touch techniques. The advanced performance Tulasara products are customised to address dry, oily, ageing, uneven, sensitive and acneic skin conditions and eye concerns, working immediately, and over time, to help accelerate the skin’s natural ability to restore and heal itself, moving your skin toward balance and revealing its natural beauty while you rest in a state of peaceful bliss. 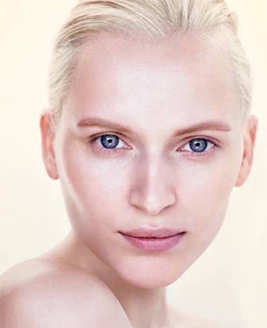 After a thorough consultation, our therapists will provide the best combination of precise, potent and advanced ingredient Tulasara products, personalised aromas and effective skin care techniques to customise a facial treatment to meet your individual needs and concerns. All Tulasara products are 97% naturally derived, better for your skin and the environment. Choose your facial from Normal to Dry or Ageing, Normal to Oily, Normal to Sensitive, or Acneic. Facial treatments are recommended on a regular basis, alongside a personalised home care routine to achieve and maintain optimal results. Our customised facial that focuses on corrective techniques for a specific area of concern: your therapist will choose the most beneficial technique for your skin from either exfoliation, correction or nourishing face and neck massage. Designed to introduce complete balance to your skin and wellbeing to your body and mind, this Tulasara facial treatment is fully customised to intensively treat your individual skin concerns. A truly restorative experience that includes foot and scalp rituals, aromatic steam towels, essential oil aromas, detoxifying massage techniques, deep cleansing and dry skin brushing and exfoliation techniques that lift away any dull, dead surface skin cells to invigorate and renew, revealing fresher, more radiant and youthful looking skin. 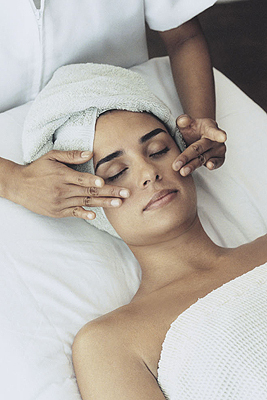 A truly luxurious head-to-toe experience designed for total relaxation and skin rejuvenation. This is an advanced Tulasara Complete Facial that also includes a foot and leg massage, nourishing hot oils and massage to the scalp, a combination of pressure points, lymphatic drainage and Ayurvedic massage techniques to truly leave your skin looking refreshed and replenished, and your mind restored. The Dual Exfoliation Peel is Avedas' latest advancement in non-invasive, skin-renewing treatments. Using innovative techniques, suitable for all skin types, this treatment combines Avedas naturally derived mechanical (granular) and biochemical (dissolving) exfoliation methods into one powerful service that transforms and rejuvenates the skin through the process of dual exfoliation. The treatment delivers immediate, visible results in improved skin texture and radiance, smoother appearance of fine, dry lines and refined pores, revealing fresher, younger looking skin. In clinical studies the Dual Exfoliation Peel achieved better results than a combined Microdermabrasion/30% Glycolic Peel treatment in both immediate smoothness and radiance, plus significantly better results in smoothness, radiance and improved skin tone after one week. Advancing the science of chemical peels, this professional facial treatment helps to retexturise the skin by smoothing fine, dry lines, reducing pore size and restoring radiance. Safe for acneic skin conditions, this can be performed as a stand-alone treatment or added to any other facial treatment whenever your skin needs the exfoliation and radiance benefits of a 30% Glycolic Peel procedure without the associated redness and irritation. A safe, painless and gentle non-invasive alternative to plastic surgery procedures that shows both immediate and long term results. Microcurrent works in harmony with the natural bioelectrical currents found in our bodies to help speed up the regenerative process, promoting collagen and elastin production in your skin to plump and improve elasticity. Fine lines and wrinkles are reduced, skin tone becomes more even and the supporting muscle tissue under the skin is strengthened resulting in firmer, healthier, more youthful looking skin. This advanced facial treatment includes deep cleansing, circulation boosting and detoxifying techniques. Can improve facial muscle or nerve dysfunction e.g. Bell's Palsy, and is also excellent for improving scars. Aveda products are incorporated into the treatment. So much more than just an eye treatment, this intensely refreshing and energising treatment works to diminish dark circles and reduce puffiness around the eyes using the power of Aveda’s new 98% naturally derived Botanical Kinetics Energising Eye Cream, combined with the gentle activation of specific pressure points around the eyes to increase circulation, relieve headaches and brighten the eye area. During this amazing treatment, your skin will benefit from intense moisturisation from the Botanical Kinetics Intensive Hydrating Creams and healing massage movements to release tension, while aromatic hot towel rituals to the face and feet soothe body and mind, promoting total wellbeing.